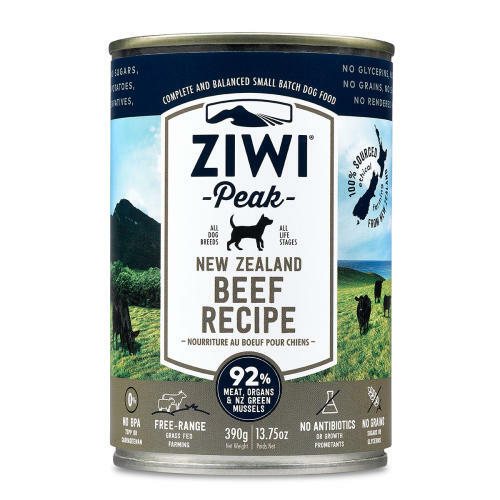 The ZiwiPeak Daily Dog Cuisine Beef Adult Dog Food is a delicious new addition to the ZiwiPeak range. Ziwi put the best of New Zealand into authentic farm-to-bowl products so you and your dog can share a lifetime of adventures together. Beef and Beef Organs (Beef, Beef Lung, Beef Kidney, Beef Liver, Beef Tripe, Beef Bone), Chick Peas, New Zealand Green Mussel, Dried Kelp, Vitamins and Minerals. Sodium Chloride 770mg/kg, Zinc Amino Acid Complex 150mg/kg, Copper Amino Acid Complex 37mg/kg, Selenium Yeast 29mg/kg, Manganese Amino Acid Complex 17mg/kg. Feed Ziwi to your pet on a daily basis. Adult: For every 7kg/15lb of dog body weight, feed between 3/4 and 1 1/4 cans per day. Puppies and pregnant or nursing females: feed approx. 1 1/2 to 2 times this amount over 2-3 feedings per day.